Alright, kids, here it is. 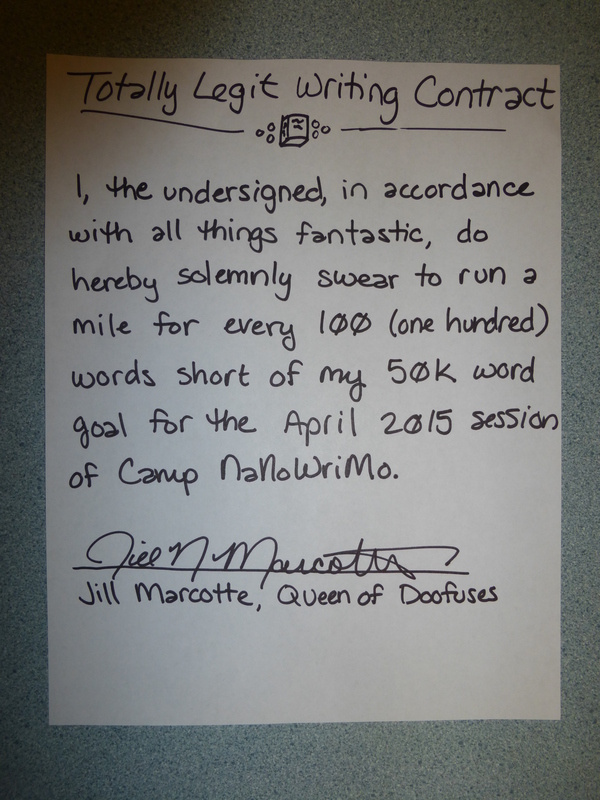 With another session of NaNo bearing down on us, I give you: my oh-so-official writing contract. Complete with punitive action! Whee! So! Those of you who’ve been around here for a NaNo before know the drill. (And those of you who don’t know what the heck I’m talking about: go learn about NaNoWriMo!) Expect the quality of posts to slide! Expect absurdity! Expect dorky comics! Expect last minute flailing and terrified tweets! Should be magical! And in one month’s time, we can all breathe a big sigh of relief and life can get back to normal- you know, assuming I don’t have like two hundred miles to run. Anyone else out there doing this session of Camp NaNoWriMo? Tell me about it! In the comments, share your title, genre, and word goal. And if you too have made a goofy contract, let me know where I can go look at it. Because fun!